Two Books in their 2nd Edition to meet Cruiser needs. . . If you are in the process of buying and installing an IC M802, the best book for you is my Volume 5 below, “Icom IC M802 Starting from Scratch”. Volume 5 contains the procedures in this book and will guide you through the process of buying, installing and testing of a new radio, plus HF SSB email setup. If you have an Icom IC M802 already installed and just need operate the radio and take advantage of the power within the M802, you only need Volume 3 "Icom IC M802 Made Simple for Cruisers"
By the Way: If you plan to go Cruising you need an HF SSB radio for weather, emergencies, email, cruiser nets etc. The best one for is the Icom IC M802 as it provides unique capabilities not found in any other HF SSB at a price cruisers can afford. 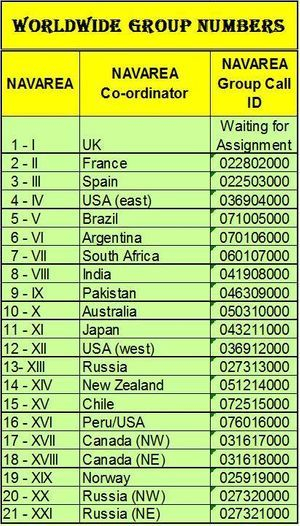 Also, Make sure you are in the ITU database so SAR units have your info. See *Was your MMSI sent to the ITU* under links to the right. If you are thinking Sat Phones, they make a nice backup to routine communications and playing on the internet. Sat phones do little for you in an emergency or if you are approaching hazardous conditions as Sat Phones are a one to one call for help. The HF SSB is a one to many blast for help! If I need help I want every commercial ship around me to know about it. Check Out Icom IC M802 Made Simple for Cruisers on YouTube! "Icom IC M802 Made Simple for Cruisers"
High Frequency Single Side Band (HF SSB) using the state-of-the-art Icom IC M802 is a necessary tool when cruising. HF SSB is a one to may communications device and is the best way to stay out of trouble at sea. With the M802’s Digital Selective Calling (DSC) capability, a distress call from your boat will probably be heard around the world. “Icom IC M802 Made Simple for Cruisers” is intended to be for cruisers that already have an IC M802 installed on their boat. The book provides very simplified operating procedures supported with many color graphics that aid in understanding the steps to use, program and make DSC calls. The key to being able to use the full capability of your radio is a good manual. The Icom manual is written at a very high level and as such most folks that are not “radio geeks” have trouble figuring out how to use the basics. After teaching cruisers how to use their M802, they find out how simple it really is to use the IC M802. So, I decided to write a Made Simple for Cruisers manual so all cruisers can utilize the full capability of the IC M802. My Made Simple for Cruisers books are simple as a result of my experiences when I taught at Electronics at Columbia Basin College in Washington. It became clear to me that what seemed simple to me then is not for someone that is trying to learn. My students taught me that when writing procedures, keep it simple and assume no prior knowledge of the reader. My goal for my Made Simple for Cruisers Series of books is to keep the procedures and layout of the book as simple as possible for complex things and to include additional information that will help other cruisers understand the concept of the subject. Note: The new version (Serial Numbers 11xxxx) of the M802 does not respond to “All Ships” calls from the older radios. However, the older version M802s do respond to the new “Geographical” calls. “All Ships” calls are received only by coastal stations. The new M802 conforms to International Telecommunications Union (ITU) Class E platforms requirements. "Icom IC M802 Starting from Scratch"
“Icom IC M802 Starting from Scratch” is for cruisers who want to buy and install an HF SSB radio on their boat. This is a one stop shopping book that covers HF SSB basics, Ships Licensing, purchase the right parts, installation the parts right, configuration of radio, testing the system, and setting up your HF SSB email. This book also includes an enhanced versions of my procedures found in the popular "Icom IC M802 Made Simple for Cruisers". After finding so many poor installations on cruising boats, it was clear that the basics for new installations needed to be covered. Even many of the boats that have had “professional installers” have had major issues. If you are planning to buy an HF SSB radio or just getting ready to install one, you will save time and money if you have read this book before installation. A check sheet is provided to make sure all the parts are available for installation. Another check sheet is included to guide you through an inspection of the new installation to make sure the radio is operational and does not get damaged when you key the microphone the first time. As an added plus the book contains a three discount coupons worth $120.00 for the system and components you may want in your HF SSB System. Buying this book and using the coupons, makes this book more than free. . . . . . . . Note: SeaTech Systems was recently sold. The new owners have indicated they will continue to honor the $100 rebate for a system purchase from SeaTech Systems. However, they are now located in Washington state and have new phone numbers. Worldwide Group Numbers (WGN) are a new concept that may take time for total implementation. 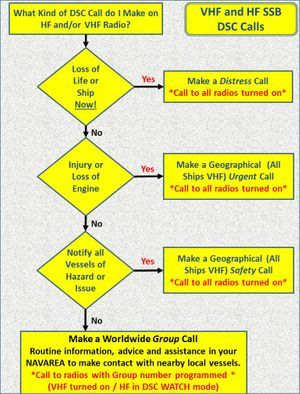 As the concept grows, Cruisers will become safer without having to use emergency type calling on HF and VHF radios. A Group number is entered in the Group Address book for both HF and VHF radios. The number will not work if added to the Individual address book in a HF or VHF radio. The WGN, as per typical group numbers starts with a "0". 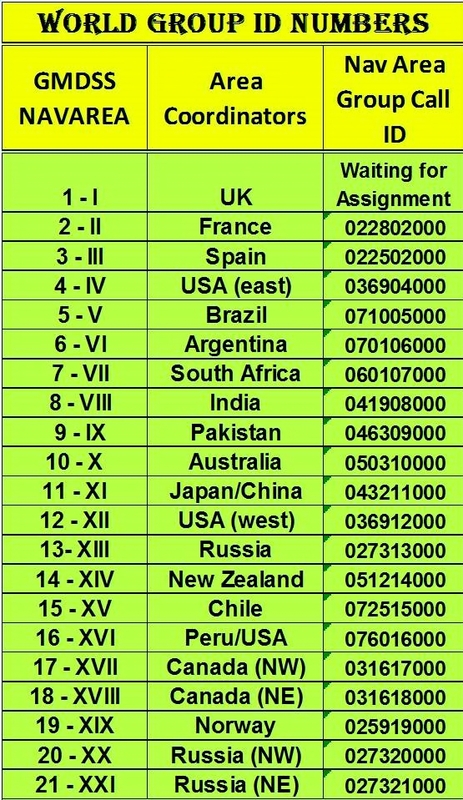 The next three digits are the country MID per the ITU. The remaining parts of the number use the Global Maritime Distress and Safety System (GMDSS) Metarea NAVAREAS numbered I - XXI followed by three zeros. Cruisers should keep the M802 in DSC Watch Mode to receive calls. Be sure your DSC Watch Mode is scanning simplex. See procedure to the right "DSC to Simplex for Cruisers" to expand HF DSC calling capability for calling and receiving calls on all 6 frequencies. Take a look at the IC M802 Radio. so distress calls will not be heard by surrounding vessels. 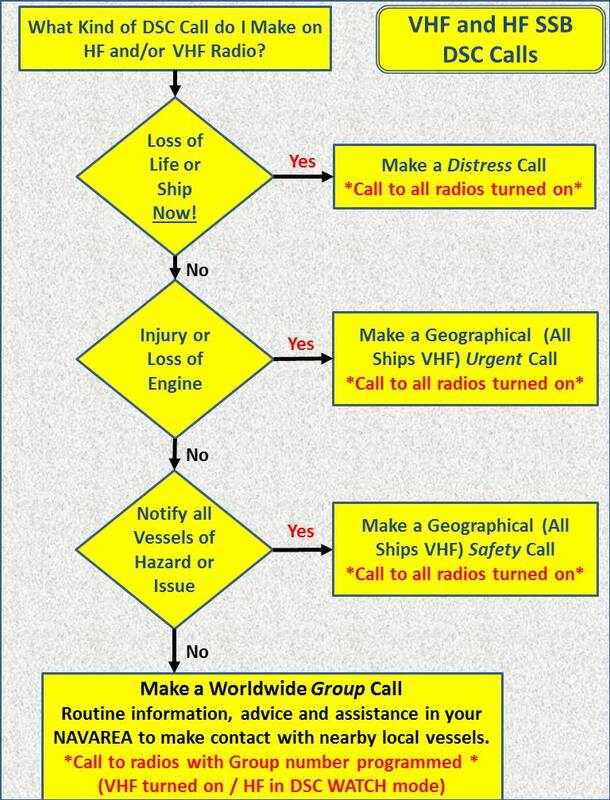 Similarly, non-DSC distress calls likely will not be heard by DSC-equipped vessels, which are required to monitor only the DSC distress channel. Consequently, grant of a waiver will contribute to the safety of vessels in distress. Link to Error in Units I have programmed to 4-1-2013! Download files & Links below.